Framagraphic now has three little wallflowers. When you pair a French Horticulturalist and a Communications Graduate, you get By Nature. 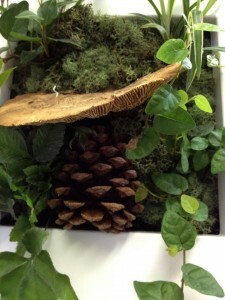 A new, Vancouver-based business that specializes in bringing a green touch to your home. These are living frames. They are framed planters that support living and growing plants. How can a wall fixture support life? The frames have an innovative watering system built in to the back of the frame. Water is filled in through a spout at the bottom, and a woven fabric with a wick structure pull the water from the bottom of the frame up to the roots of the plant. The system allows the plants to survive with as little as 2 – 3 waterings per month. When the water level gets too low, a lever on the side will flick out, letting you know you have to refill. A smart little ecosystem, that lets these little wallflowers get noticed.